Okay, so I’m a few days late! What can I say? Par for the course these days. Nonetheless… thank you, thank you, thank you… for reading, for commenting, for following. Thank you, thank you, thank you… for the words of encouragement, for the creative freedom, for the orders. I started all of this in a very uncertain time of my life. It has been an amazing creative outlet, an amazing source of support and an amazing learning experience. Please keep passing my blog along, please ask me questions, please leave me comments. I want to hear what you are thinking, what you want, what you have tried. I’m looking forward to seeing what this upcoming year has in store. Until then… one more thank you! That’s right, people. I’m taking a trip. Heading out of town. Leaving on a jet plane. Okay, really I’m leaving on a regular plane, then taking a puddle jumper. Eek! But, at the end of it all, I get to hang out with this guy for a week. One whole week of John Jacob Jingleheimer Schmidt (remember?! 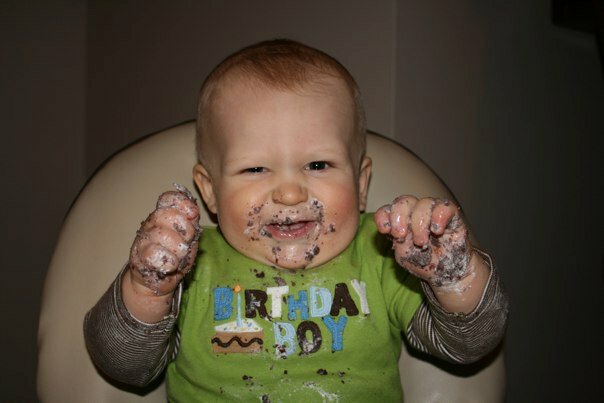 ), giggles, tubby time… and I’m pretty sure Aunt Kristina will bake a thing or two. The bonus? 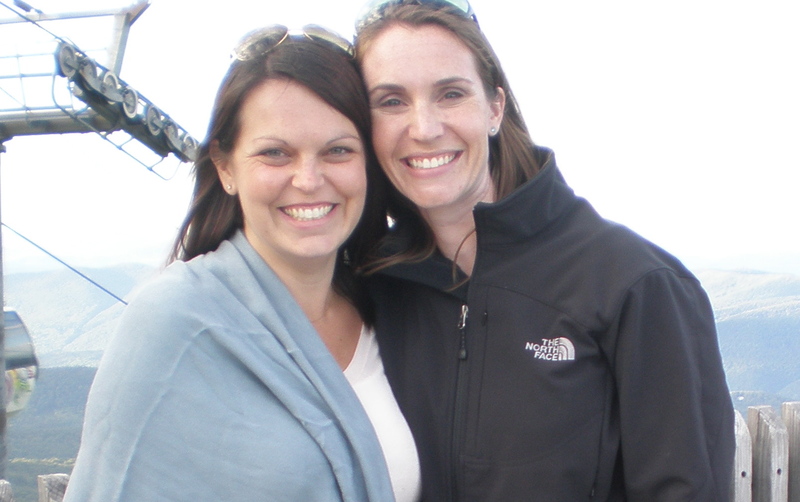 I, unexpectedly, also get to hang out with this lovely lady for a whole week too! Last time I was up there we picked fruit, canned jam, listened to the orchestra (where this pic was taken), tasted beers, visited King Arthur Flour. The list goes on. And this trip’s list has already started. So why am I telling you this, you ask? Well, this means that Kristina’s Confections will be on vacation as well. No orders will be taken for March 19 – March 27. As for my little blog here. Well, I’m sure Betty Crocker 1 (me) and Betty Crocker 2 (Jess), as Jess’s darling husband refers to us, will whip a thing or two up for your reading pleasure! 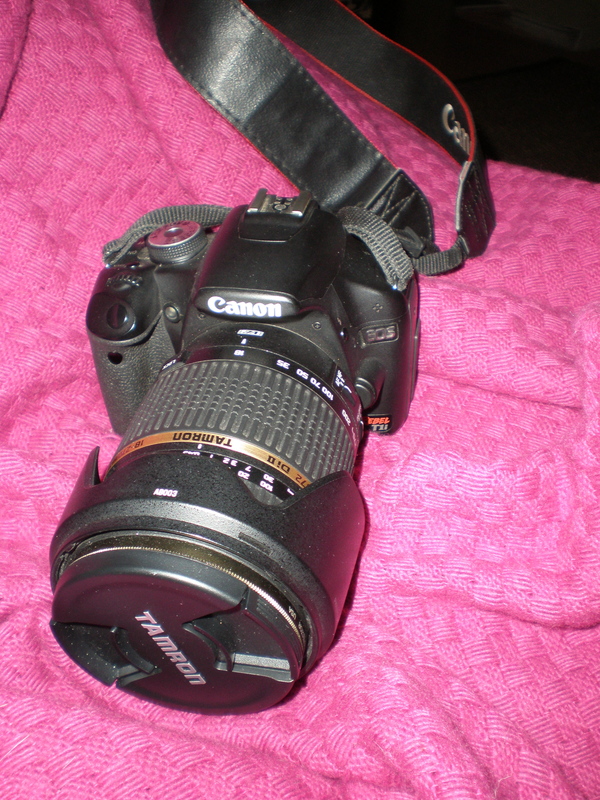 Since it is Valentine’s Day, I thought I would introduce you to my new love… my Canon Rebel T1i. It was an early birthday present to myself (ahh!). I figured it was time, an opportunity presented itself and I bit the bullet (so unlike me to act a bit in haste). As for me, I’m enjoying getting to know this new love. Can’t wait to take it on upcoming trips, try it out during new adventures and, of course, test the capabilities in the kitchen. I hope you enjoy the higher quality pictures. Er, excluding this one, of course! The Beginning – Part 4: I’m Doing What? A number of friends and family members told me I should start a baking business. I dismissed them all. I loved baking, but simply as a hobby. As a business? Crazy talk. That was until my mom and a dear friend put the wheels in motion – without so much as a discussion with me (isn’t that how it usually goes?!). Mom came home one day and said we were having an open house in a week. My logo was set. A flier was in the works. I just need to get to it. After pleading my case, I was able to get all to agree to push the date back. Beyond that, we were full speed ahead. For the next three weeks, I worked on flavor combination, cookie shapes and my vision (you seeing a theme yet?) for the set-up. 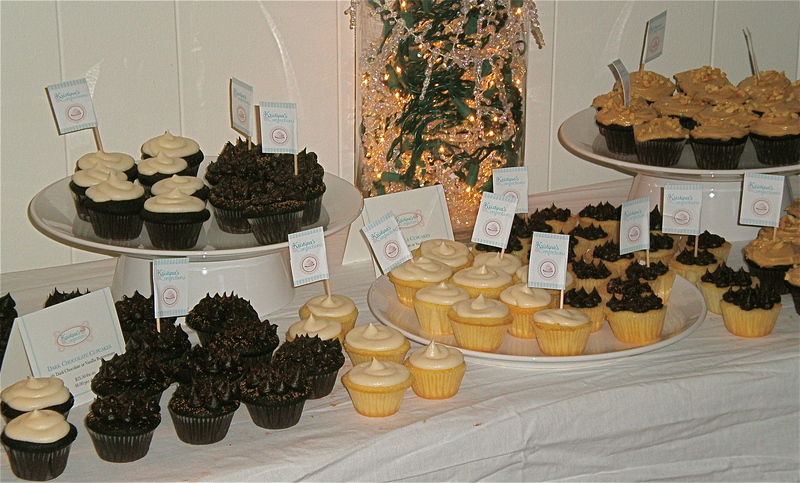 Table one was everyday – chocolate, vanilla and peanut butter. And twinkle lights. Everything looks better with twinkle lights. 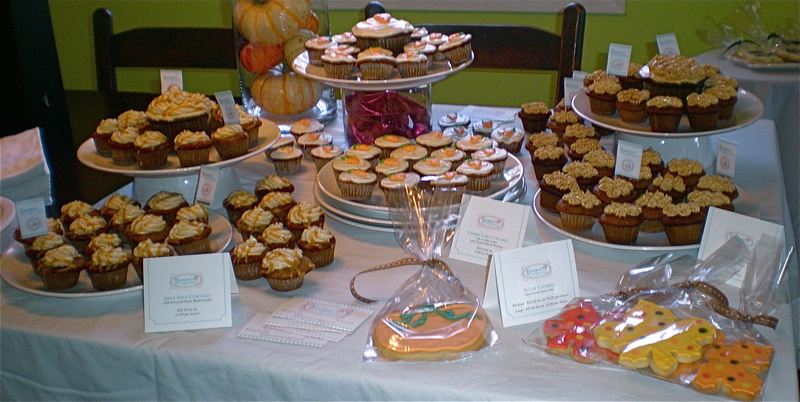 Table two was fall – apple with caramel swiss buttercream, carrot cake and pumpkin with maple spice swiss buttercream. Table three was winter – triple coconut, sample holiday cookies and sugar cookie medallions to taste. 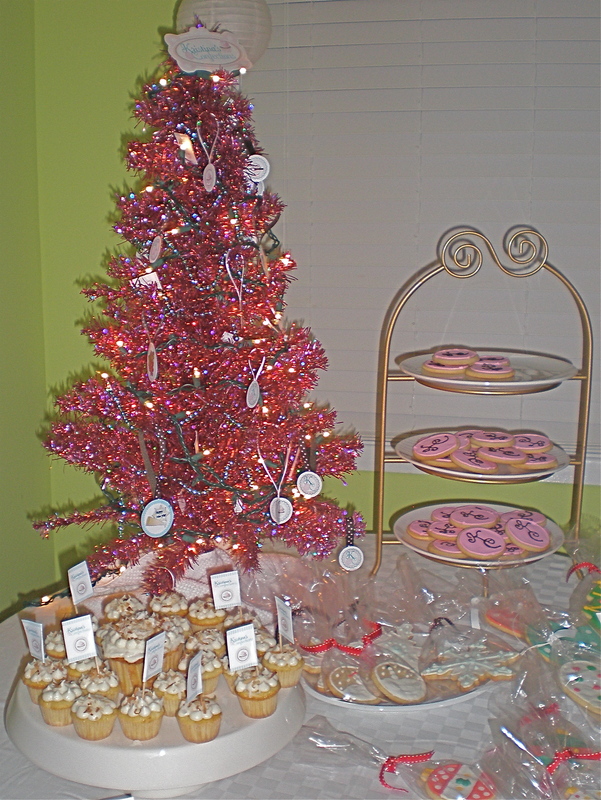 The pink tinsel tree was a gift. It’s officially my mascot. I love it – pink tinsel, teal garland, twinkle lights and all! 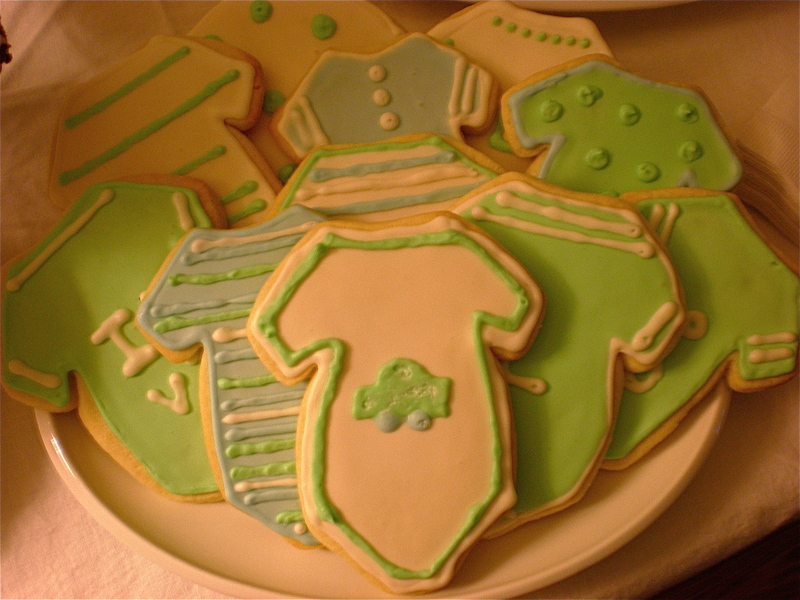 By the end, I sold nearly all of my cookies-to-go, had orders through December and requests for custom cookies. 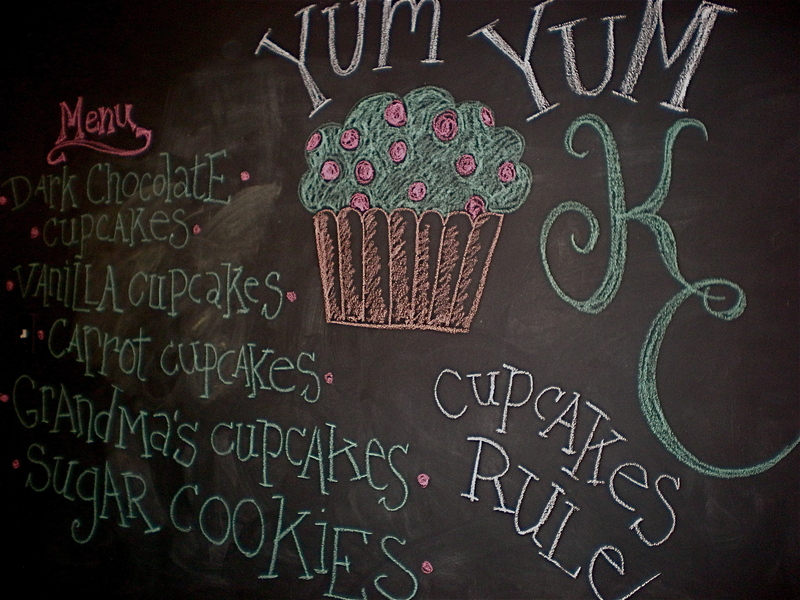 And so began… Kristina’s Confections. The Beginning – Part 3: Oh, boy! My best friend, Jess, had a baby boy last December. He is now my godson and the main man in my life – we both couldn’t be happier! Anyway, in October I hosted her baby shower. I had a vision – shades of blues, flickering paper lanterns, toys for centerpieces and food. Delicious food. Together it would be clean, crisp and my visionary dream come true. With my recent baking escapades, I knew the dessert table had to be perfect – not to mention that Jess is a fellow lover of sweets! Since one of her personal favorites is s’mores (she once ate 7 in a single campfire sitting), I started there. 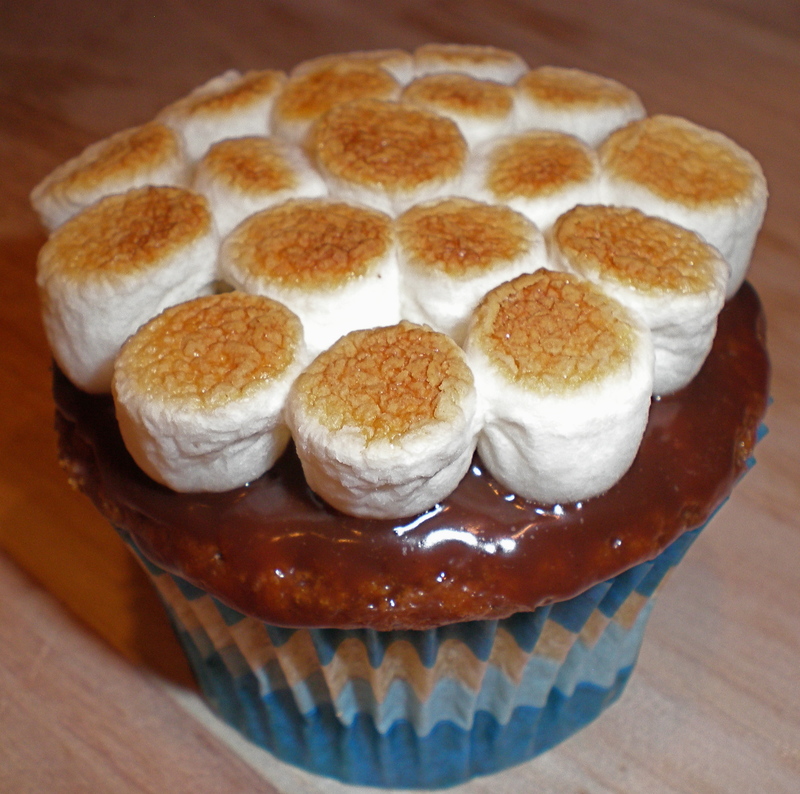 After testing out a couple of recipes (none of which I loved), I decided on a graham cracker cupcake base, slathered with milk chocolate ganache and topped with slightly toasted mini marshmallows. Delicious and reminiscent – lovely combination! 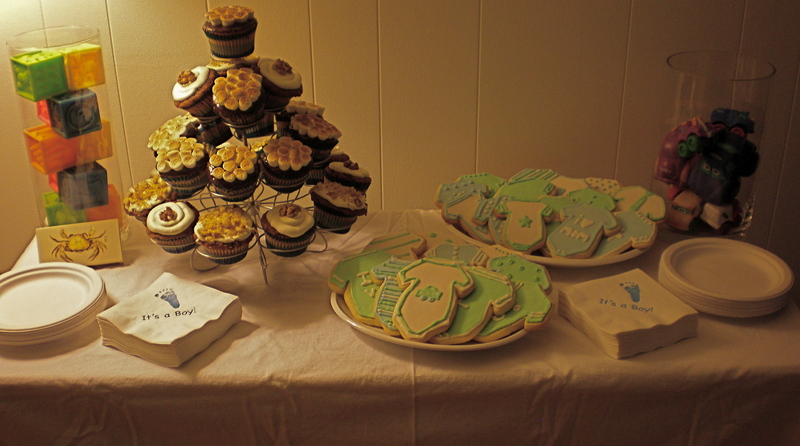 Besides the cupcakes, I wanted the dessert table to include onesie cookies. I couldn’t find anything I liked online, so I figure I’d just make them. Since I had never made rolled sugar cookies, I set out to find the perfect recipe – firm enough to decorate, soft and chewy texture, great flavor. Well, easier said than done. Two months and six recipes later – I had it! An almond sugar cookie, perfect for decorating and actually good enough to eat. That decorating part, though. I wasn’t exactly sure where to begin. So I researched. And thankfully came across two of the greats – Bridget and Annie. By reading copious amounts of blog postings, I was ready to tackle those onesies. At the time, I loved all of them. I was so proud that I pulled off decorated sugar cookies (did I mentioned I didn’t actually test run the decorating part before the big event? I never learn). They were a big hit. Now, of course, I look at them and shutter a bit. The icing was thinned too much, my piping isn’t straight, some of my designs are erratic. But they still hold a special place in my heart. Plus, it’s always nice to see where it began. My mom went to a cookout a few weeks after the birthday celebration and asked if I would make some cupcakes for her to take. I didn’t just want to replicate the chocolate and vanilla cupcakes, so I set out to find something unique for summer. 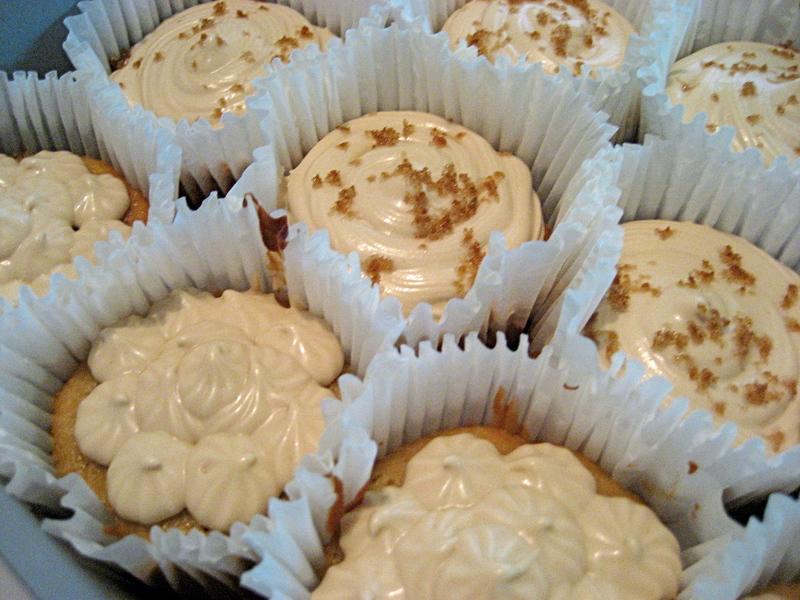 I found a peach cupcake with brown sugar frosting from Smitten Kitchen and it was settled. The delicate cake, mixed with chunks of fresh peaches and topped with a just sweet enough buttercream was perfect for a summer cookout. It was a huge hit, especially with the adults. I didn’t know it at the time, but, with a few tweaks, my first seasonal flavor was born. The Beginning – Part 1: Birthday Celebration! I LOVE sweets. That’s a fact. As a result, I love to bake. Another fact. Last summer this confections adventure began when I offered to make cupcakes for two of my best friend’s birthdays, which happen to fall a day apart. 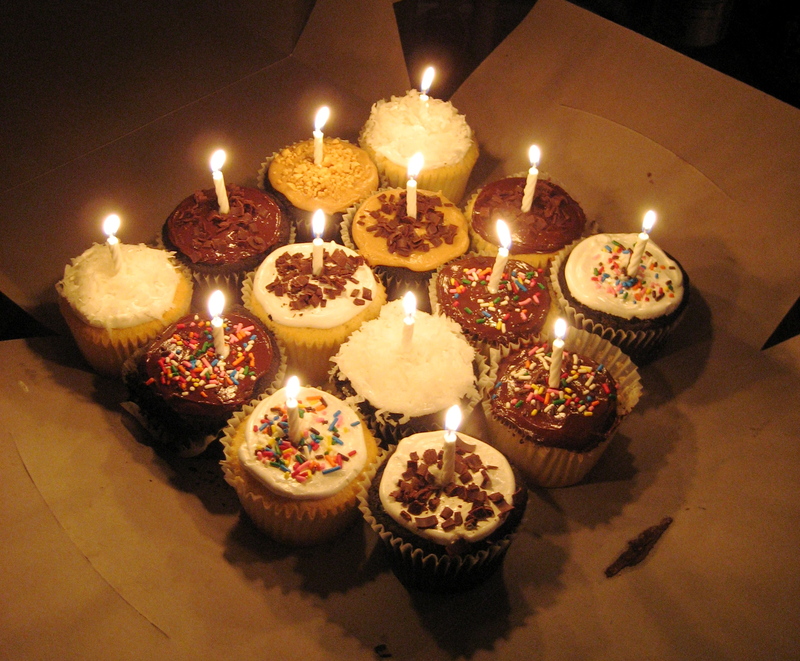 I’ve made cakes and various other sweet treats from scratch before, but I wanted to put together something special. I took my task seriously. 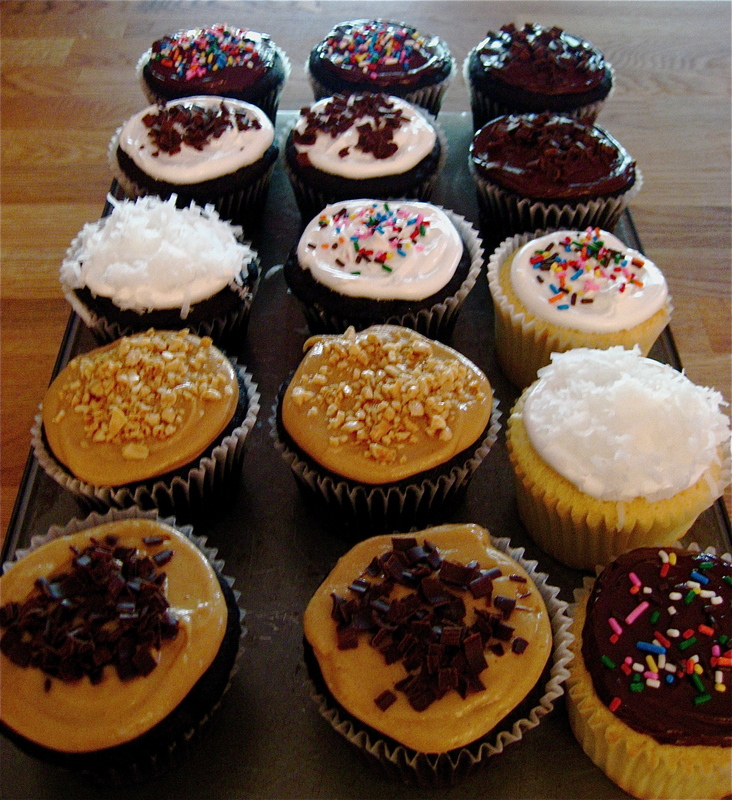 I knew I wanted to offer options – in cupcake base, frosting and toppings. I researched recipes, sketched out some combinations and got to it. I literally spent all day baking and it was, easily, one of the best days I had all summer. Turns out you should test recipes before the actual day of the event (who knew a vanilla cupcake recipe could taste like a corn muffin?! ), but it was a lesson learned and, after an extra batch or two, everything came together. I have since changed most of my recipes – in fact the only recipes I use from this first day are the peanut butter frosting and the chocolate cupcake – but it was a great way to start. I realized a failed attempt isn’t the end of the world. Even if you like one recipe, try another, it just might be better. Above all else, don’t be a afraid to tweak things.